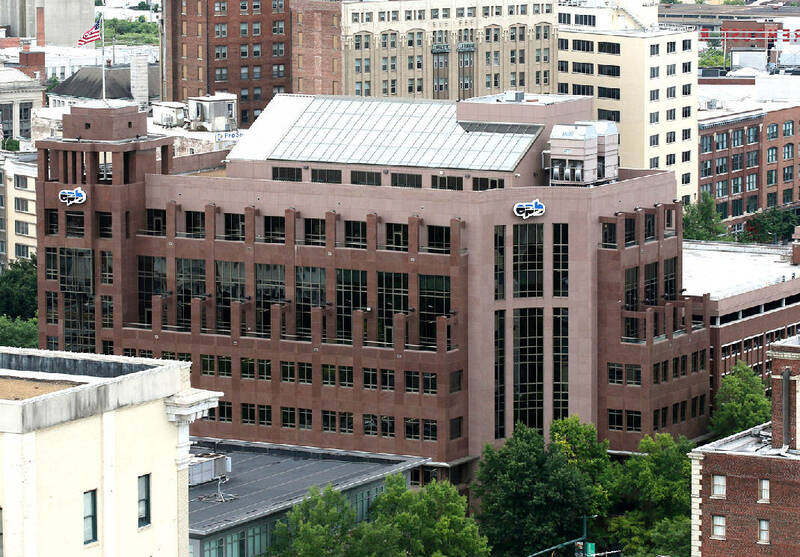 The EPB building is seen from the Republic Centre building Thursday, May 28, 2015, in Chattanooga, Tenn. The Republic Centre is the tallest building in Chattanooga. EPB began Monday signing up low-income families for its discounted, high-speed Internet service. EPB and its partners at Hamilton County schools started the enrollment process for the NetBridge Student Discount Program, which enables access to EPB's high-speed broadband for only $26.99 per month for households with children in Hamilton County's free and reduced-price meals program. The discounted rate for low-income families is less than half of EPB's standard Internet rate of $57.99 a month for 100 Mbps service. "Everyone benefits when all of the children in our community have the tools they need to realize their potential," EPB president and CEO Harold DePriest said in a statement announcing the rollout of the new plan. The Hamilton County Department of Education will provide validation in a two-step process through Sept. 20, EPB officials said. Families must be qualified by the school system to receive meal subsidies and provide written permission for local schools to release that information to EPB. EPB is providing local schools the permission forms, which local public schools will distribute along with the free and reduced meals application for parents to fill out. After the validation process is complete, EPB Fiber Optics will offer qualified families 100 Mbps Internet service for $26.99 per month with no installation fees, contracts or other conditions. About 20,000 students in Hamilton County meet the criteria to receive meal subsidies. The NetBridge program was announced by Chattanooga Mayor Andy Berke during his State of the City address in April. "Chattanooga is home to the fastest, cheapest, most pervasive Internet in the Western Hemisphere and we must make sure as many citizens as possible have access to this game-changing infrastructure," Berke said. Partnering with Hamilton County Mayor Jim Coppinger, EPB is also making the NetBridge discount available across the county. All qualified students within EPB's service will be able to benefit from the NetBridge discount at their primary residence. "The NetBridge program will help more students access Internet resources which can help them prepare for family-wage jobs after they graduate," Coppinger said. Although EPB will provide the fastest Internet service, Comcast offers a cheaper alternative for many low-income families seeking lower-cost Internet connections. Comcast has offered its "Internet Essentials" for the past five years for a monthly rate of $9.95 a month, plus tax, for qualified low-income families. Comcast recently doubled the speed of the discounted Internet Essentials program to 10. The cable company also offers a purchase option for qualified families to purchase an Internet-ready computer for under $150. Comcast said more than 13,500 Tennessee families have already signed up for Internet Essentials.